These are instructions to make a large quilted wall hanging, which we dedicated to the well-known British author, Jane Austen. 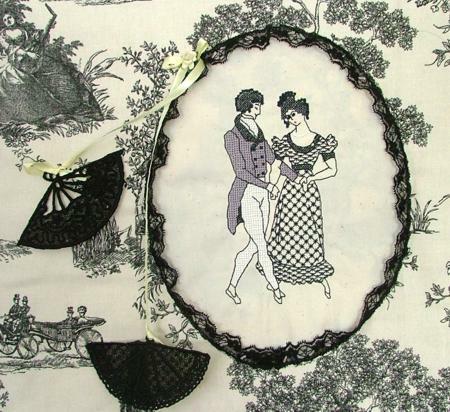 We used patterned cream toile with a 19th century theme and the designs of Jane Austen, and Writing a Letter, Dance, Girl with Cat, Harp-Player, Walk and Tete-a-tete and Fan Lace Set. 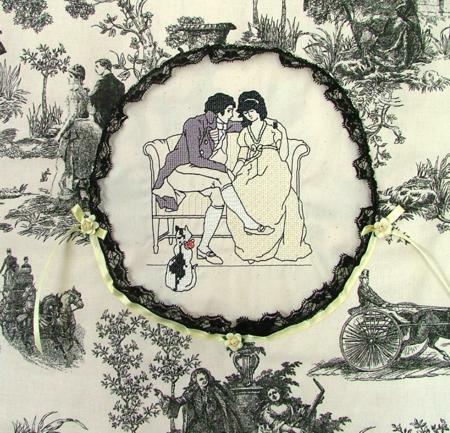 These embroidery designs, except for Jane's portrait, were made from drawings by J. Brooks, a 19th century painter, who illustrated Jane Austen's novels. 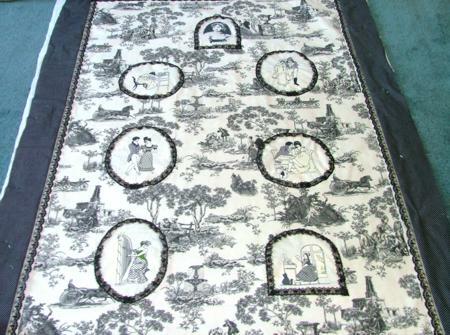 Materials: 61" x 41" toile, cream cotton fabric for embroidery (matching the toile), 6 yards of 1" wide black lace and 6 yards 1/2" wide black lace, cotton fabric for framing (we used black with small white dots), 50" x 70" fusible batting and 50" x 70" cotton fabric for backing. Use medium-weight iron-on stabilizer for the embroidery. Step One: Cut out all the needed parts in accordance with the layout. All the sizes are listed without seam allowance: don't forget to add at least 1/2" to every edge. You should get: a piece of toile, measuring 41" x 61"; 2 strips of cream cotton fabric, measuring 2" x 63", 2 strips of the same fabric, measuring 2" x 43"; 2 strips of dark patterned fabric, measuring 5" x 67", and 2 strips of the same fabric, measuring 5" x 47". 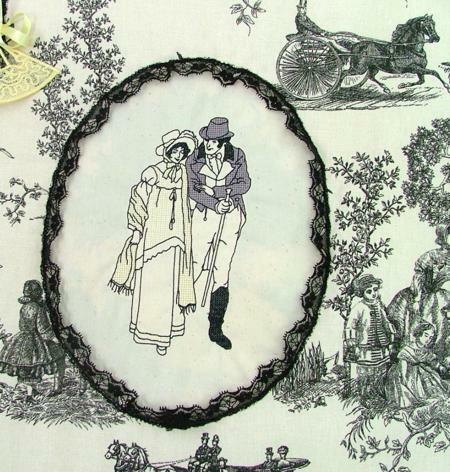 Step Two: Stitch the strips of cream cotton fabric onto the edges of the toile, as shown below. Press the seams. Step Three: Baste 1" wide lace along all the edges, folding it inwards. Finish the short edges of the strips of dark patterned fabric and stitch them onto the edges of the working piece, attaching the lace at the same time. Set aside for the time being. Step Four: Out of plain cotton fabric cut 7 pieces measuring about 8" x 10" . 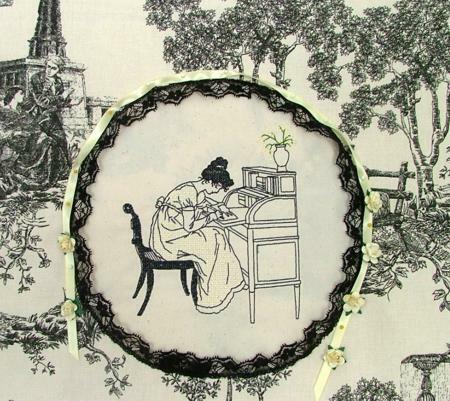 Stabilize, hoop and embroider all the designs. Note: feel free to change the colors of the designs in accordance to your taste. For example, we used pale yellow instead of pink rose. 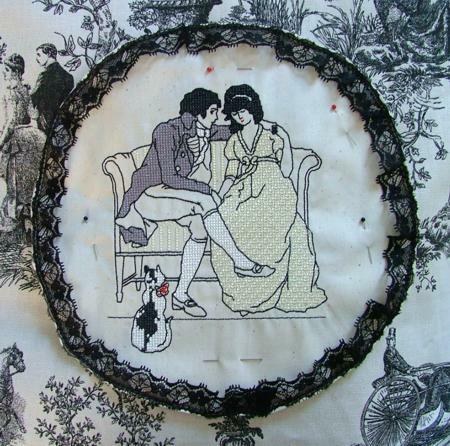 Step Five: Spread the toile piece on an even surface and arrange your embroidered pieces on it. Out of paper cut a shape for each design; we used ovals, circles and arcs. Trace each shape with a removable marker and cut the embroidered pieces out according to this outline, leaving 1/4" of seam allowance. Step Six: Finish the raw edges of each embroidered shape - fold the seam allowance to the back side, baste and press with steam. Baste thin (1/2") lace along the edges. 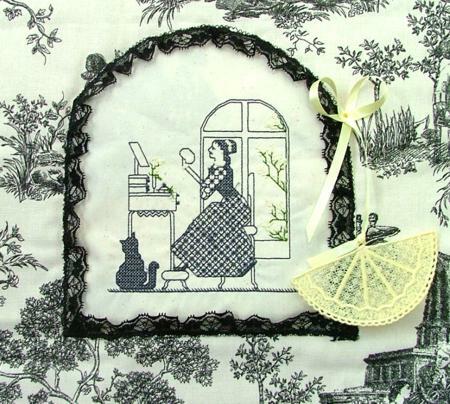 Place the embroidered shape on toile, pin or baste and zigzag in place. 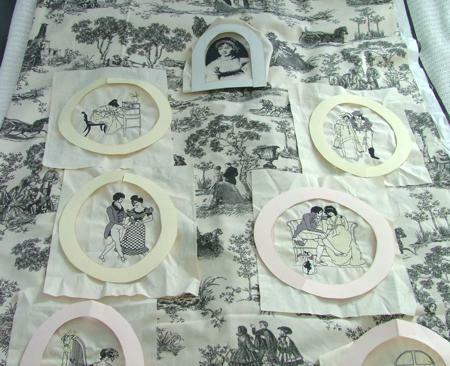 Step Seven: On an even surface, table or floor, spread the cotton backing, cover it with batting and then cover with your toile working piece. Spread all three layers evenly and pin them. 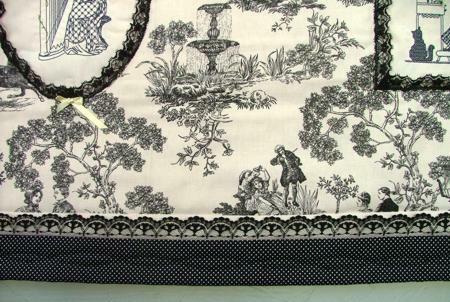 Press to attach the fusible batting to the toile part, do not press along the black strips. Quilt along the seams of the embroidered pieces first, then quilt along the side seams. Step Eight: Fold the black patterned strips onto the face of the quilt. Trim the backing and batting to 2" from the seam. Step Nine: Unfold the black patterned strips again and fold them back over the backing and batting. Stitch in place. Press. The quilt is basically finished, but if you like, you can add some more decorative touches. 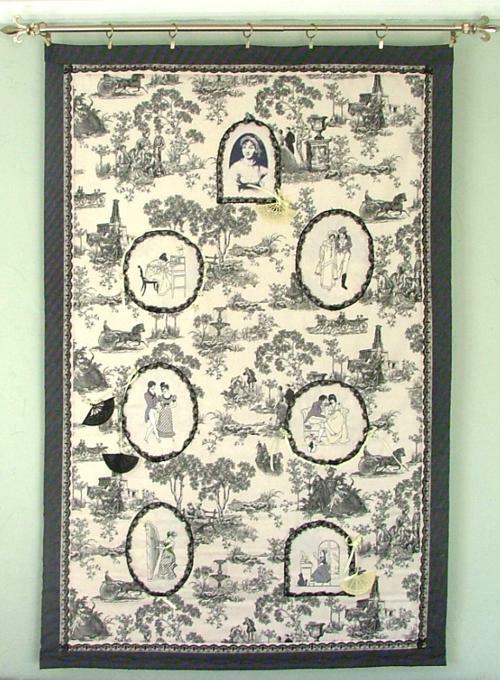 Step Ten: You can quilt the black frame of the wall hanging, as we did, or leave it as it is. We used narrow satin ribbon, tiny silk roses and free-standing lace fans to add some accents to the quilt. 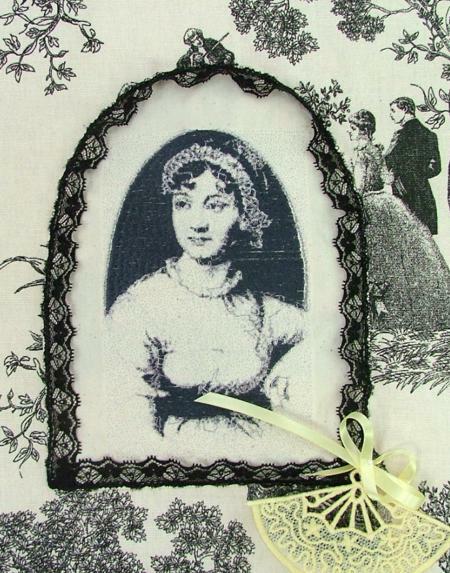 You will find Jane Austen's portrait in the Author's section of Famous People. Writing a Letter is in the Beauties section of the Catalog. Walk is in the Beauties section of the Catalog. Dance is in the Beauties section of the Catalog. Tete-a-tete is in the Beauties section of the Catalog. Girl with Cat is in the Beauties section of the Catalog. 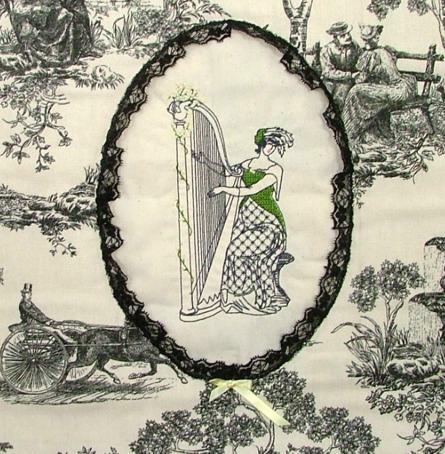 Harp-Player is in the Beauties section of the Catalog.